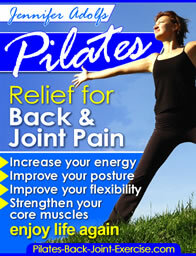 I have pain in my shoulder will Pilates help this? Treat and Prevent your Shoulder Injuries. I am 54 years old and have a frozen shoulder. How can I modify my mat workout to accommodate a frozen shoulder? Anything that does not give you pain in the shoulder. Probably any of the back lying exercises; bridges, single leg stretch, double leg stretch. Of course you would leave your arms down, maybe curl your head, support the affected shoulder with pillow under it. Best Exercises for Frozen Shoulder. Here is my Shoulder Ebook detailing exercises to help with different conditions. Some of your mat exercises may be more comfortably done on an exercise ball. Side kicks, kneeling work with your arms supported, sitting on top, and back lying.